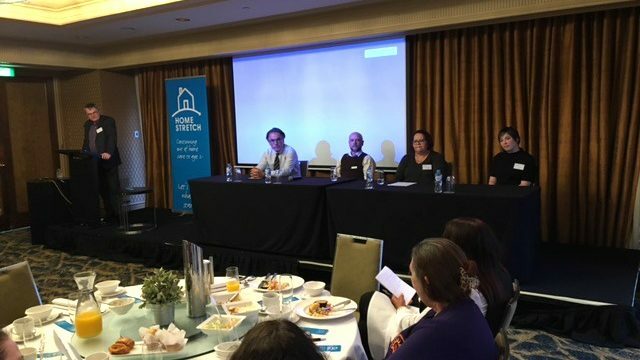 The Western Australian Home Stretch Committee hosted a successful breakfast event on Thursday 21 September at the Hyatt Regency Perth. The morning involved a panel discussion and a wider dialogue on extending the leaving care age from 18 to 21 years in Western Australia. Panel members included Paul McDonald, Chair, National Home Stretch; Dawn Wallam, CEO, Yorganop; Sarah Lewis, WA State Coordinator, CREATE Foundation; and Stephan Lund, Executive Manager, Wanslea Foster Care. Following the breakfast event a small group of representatives from the Home Stretch WA Committee, the National Chair of Home Stretch, and Department of Communities workshopped ideas for a Home Stretch WA trial. The Department of Communities previously provided strong support for the campaign and have sought advice on the implementation of a trial in WA. Consideration was also given as to how we could influence the necessary changes to legislation necessary for young people in WA to be provided with optional, extended care arrangements.